Terry Gray spends several late-summer evenings each week fixated on a chimney in downtown Moscow, Idaho. As dusk approaches, he keeps his eyes cast skyward for swirling masses of Vaux’s swifts. Slowly the numbers build, the sound of chirping fills the air and the small birds begin to circle in a counterclockwise motion before diving en masse into a chimney at the old Martin Tire Center on Second and Washington streets. “They gather real high and just start flying in a counterclockwise circle and they get tighter and tighter until it looks like a little tornado,” said Gray of Moscow, who is president of the Palouse Audubon Society. 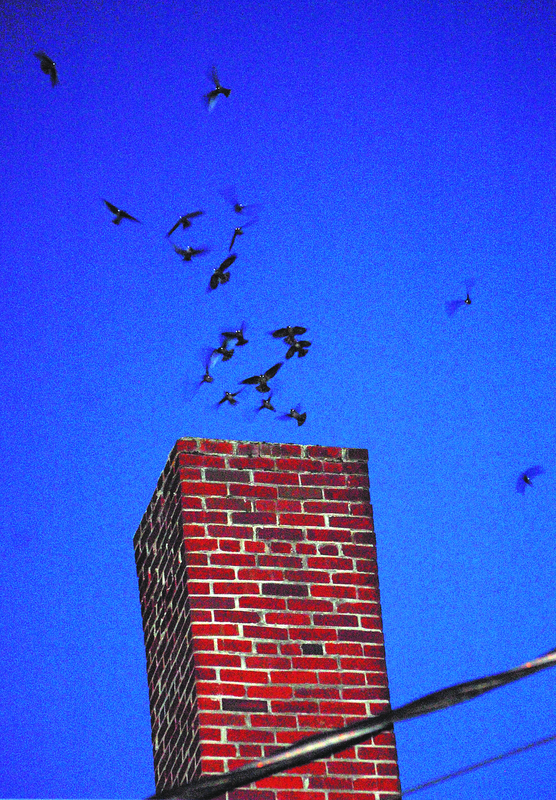 As the birds stage for their migration south, they have roosted in the old building’s chimney for the past few years. The phenomenon is known to happen in several locations in the Northwest. In some places like abandoned buildings in Portland and Seattle, several thousand birds pile into chimneys in a matter of minutes. In those more urban settings, the birds have been known to attract crowds of birders and curious onlookers. Gray is often joined by other birders or people walking by. He said as many as 30 people have gathered to watch the swirling birds in downtown Moscow. On some evenings, Gray has counted around 300 swifts piling into the chimney, but the numbers vary. Each Saturday through last week, Gray made a count for the Audubon Society’s “Swifts Night Out” project to track the number of Vaux’s swifts using chimneys as the prepare for migration. The project could help confirm if the swifts are declining. “They (each) catch 30,000 bugs a day, they figure,” Gray said, highlighting a swift’s virtue. Swifts have traditionally used tree snags for roosting, but they have more recently begun to use chimneys. Gray thinks the switch may be because there are fewer suitable old dead trees and old-growth forests on the landscape. The swifts sometimes are mistaken for bats, probably because they are acrobatic flyers and are most readily seen in the late evening when bats begin to appear. Gray said it’s easy to tell them apart because bats are leaving their roosts at the same time swifts are arriving. He said if people see small flying critters entering a chimney or tree snag, they’re likely to be swifts. If they are leaving, they’re probably bats. They can be seen throughout the summer, but don’t roost in high numbers until fall as they get ready to migrate. The old tire center chimney this fall is little more than a pit stop for the birds. Gray said the arrival of the birds was weeks early this year. Two weeks ago he thought their numbers were beginning to thin, but three days later he counted nearly 300. On Sept. 11, 200 birds were counted, followed by only three birds Sept. 12 and a “flyover” by 10 birds last Sunday. Gray reported Monday that the Vaux’s swifts apparently had moved on for the year.